Nine sheep have been rescued from deep, icy water in a three-and-a-half hour operation after a lorry driver spotted they were drowning in a river near the M1, the RSPCA said. 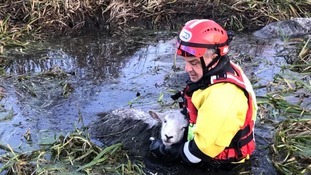 Officers from the animal charity, Highways England and Hertfordshire Fire and Rescue Service worked to save the sheep from the River Colne in Hertfordshire. Seven ewes had already died but officers managed to pull nine out of the river alive on Wednesday. Katie Wright, an RSPCA animal collection officer, said: “It was so upsetting that some of the sheep had died but I’m so pleased we were able to save nine lives. “Thank goodness the lorry driver spotted these stricken sheep and called us for help or they all would have died. Animal welfare officer Peter Warne entered the water with two firefighters, using an inflatable to pull the sheep up to the river bank. Blankets were used to warm the animals quickly. Ms Wright added: “Some of the sheep made fairly quick recoveries and soon returned to grazing in the field, but some were very weak and completely exhausted so we kept them wrapped in blankets for longer and did our best to rub them dry. A Hertfordshire Fire and Rescue Service spokesman said: “We are happy to assist in animal rescues when we are available and able to do so.